North Wales golf festival is fair way to help take a swing at £4 billion market | News by Wales Express News, People Before Profit! A major new campaign is being launched in North Wales to tap into the UK’s £4 billion golf market. North Wales Tourism have organised a brand new golf festival and produced a pocket guide showcasing the best places to play the game, how to find them, the top spots to stay on a golfing break and includes a handful of useful offers. The ambition is to cash in on the passion for the glorious game which teed off consumer spending estimated at £4.3 billion across the UK at the last count of which Wales’s share was almost £260 million. And with perfect timing the brochure has been produced just in time for a major tournament which is to be played on three of the region’s most attractive courses. NWT has produced 50,000 of the free full colour guides which are currently being distributed across North Wales and the two English regions in easiest striking distance of the 14 courses featured – the North West and Midlands. 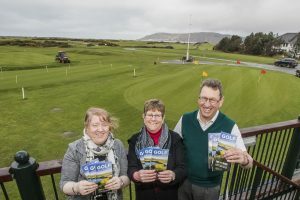 The brochure promotion gets into full swing just in time to attract competitors to a new prestige event being held for the first time, the Golf North Wales Festival. Being staged over three days from April 5-7, it’s a Stableford competition arranged specially for men and women amateur golfers. Mandy Evans, resident golf expert with North Wales Tourism and herself a keen player at the Conwy club, said: “A major study by Sheffield Hallam University revealed that in 2014 consumer spending on golf across the UK was a massive £4.3 billion and that Wales’s share was £258 million with the sport employing almost 4,500 people. “That’s a massive and growing market that North Wales can be part of and the aim of the new brochure is to help us do just that. “We’re getting things started by running the first Golf North Wales Festival in April when competitors can test their skills on two of the best links and parkland courses in North Wales. “On day one they’ll play at Conwy, a coastal links course, and the following day competitors can test themselves at Royal St David’s in Harlech, which is set against the breathtaking backdrop of Snowdonia. Day three will see them playing at Northop in Flintshire, a magnificent parkland course at the gateway to North Wales. “The festival will end with a two-course meal and presentation at Northop. “Two nights’ dinner B&B accommodation for the competitors has been specially arranged at the three-star Bay Hotel in Llandudno, which won the Best Newcomer title in the 2016 Go North Wales Tourism Awards, and there’s a drinks reception on arrival there. “The cost of the festival per golfer is a very reasonable £249 and we’re already taking bookings from people across a wide area. courses, like Conwy which is to host the 2020 Curtis Cup, an international competition which is the female equivalent of the men’s Ryder Cup. “Our new Golf North Wales brochure puts the spotlight on Conwy and 13 other fantastic courses right across the region. “They include Bull Bay and Holyhead on Anglesey, Silver Birch at Abergele, Maesdu, North Wales Golf Club, Conwy and Penmaenmawr, which is a nine-hole course, in Conwy County, Vale of Llangollen, Prestatyn, Rhuddlan and Rhyl, also a nine-hole course, in Denbighshire, Royal St David’s at Harlech and Nefyn & District in Gwynedd and Northop in Flintshire. “Four of them – Maesdu, Nefyn, Holyhead and Rhyl – were masterminded by the legendary course designer James Braid who won five Open championships in 10 years between 1901 and 1910 and was part of golf’s Great Triumverate with Harry Vardon and JH Taylor. “We know that having the right sort of accommodation is so important which is why we’ve included in the brochure a selection of golf friendly places to stay, including the three-star Celtic Royal Hotel in Caernarfon, Gwynedd, the two-star Queens Lodge in Llandudno, Conwy and The Valley on Anglesey, a lovely family-run inn. “There’s also a large scale map showing where the various courses are located and at-a-glance directions for reaching them by either road, rail or sea. “All the courses listed are very affordable and so that visitors are able to get even better deals we’ve included a selection of special offers, such as the Isle of Anglesey pass which entitles you to play any five courses on the island for only £89 and the Gateway to Wales pass which entitles golfers to play six courses in Flintshire for £100.